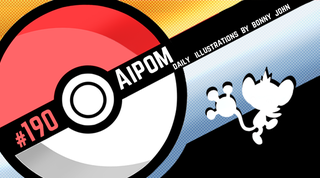 Adept Aipom! Pokemon One a Day, Series 2! AIPOM CHILL. YOU ARE SO CUTE FOR NO REASON JUST STAHP I CANT TAKE IT! Summoning the powers of Cartoon Network's Powerpuff Girls, my take on Aipom was born without the sugar, spice, and everything nice! The cute factor of the style remains! Let's go! 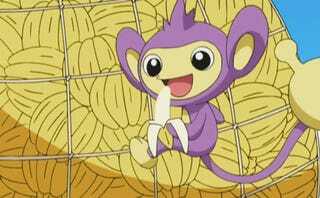 Aipom is such a cutie pie. I love that his gimmick is a giant hand, which plays on the thought that such real world creatures have an extra "limb" with their tail when they manuever about. For the piece, I knew I was going to do something with perspective, but the style was evading me. I set up the composition and looked over the creature when I noticed even in its original visual form, it resembled the way Craig McCracken's PowerPuff girl's looked like. From there, it was easy peasy lemon squeezy. Defined the outlines, and colored with flats. The Powerpuff girls have limited shading on characters, if any at all, but I thought it looked better this way. I guess that's all there is to this work! Thanks guys for tuning in! Please leave your comments/critiques if you got any below! Plus, let's hear your response to today's Question of the Day! You wake up one morning and you realize you have a tail! At the end of the tail is a gorram HAND! What kind of cool stuff do you do with it?